Stop by for coffee and kitty cuddles! We are located kitty corner from Lucky's Market. 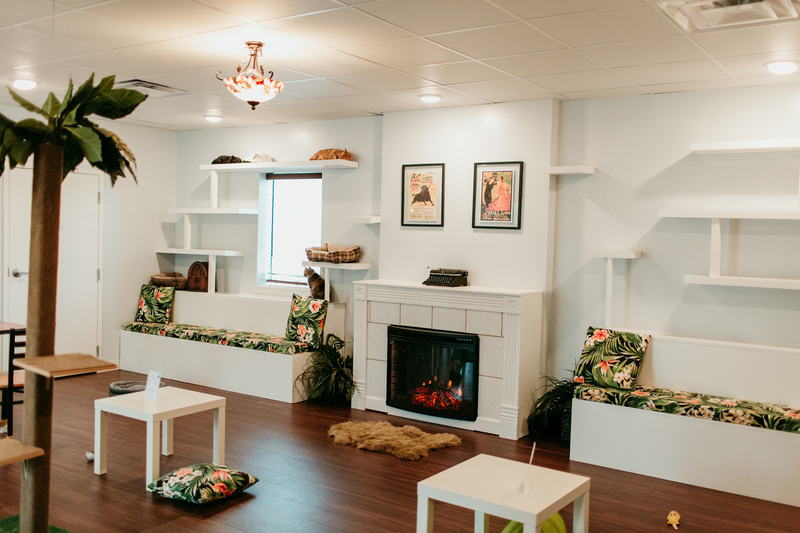 Walk-in visits are welcome, but a RESERVATION guarantees your spot in the playroom with 20 cats! And, we encourage you to sign our entry waiver before visiting to maximize your experience. Also, check out our monthly SPECIAL EVENTS like Wine Night, Book Club, Yoga, and more! It's a cafe with cats, of course! On one side we have a small cafe with coffee and baked goods, and on the other side we have a cat playroom filled with 20 adoptable cats ready to be loved. 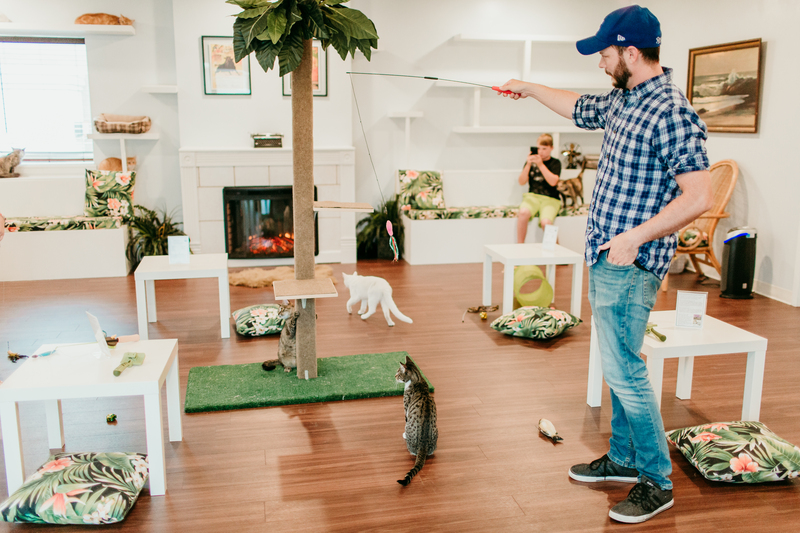 Papa's Cat Café is central Missouri's first cat café, bringing cats and people together in an environment fit for both. Our cat playroom is inspired by the home decor and life of Ernest "Papa" Hemingway, one of America's most interesting and influential authors. He also happened to love cats. In fact, his famous Key West home now houses more than 50 polydactyl (extra toed) cats! 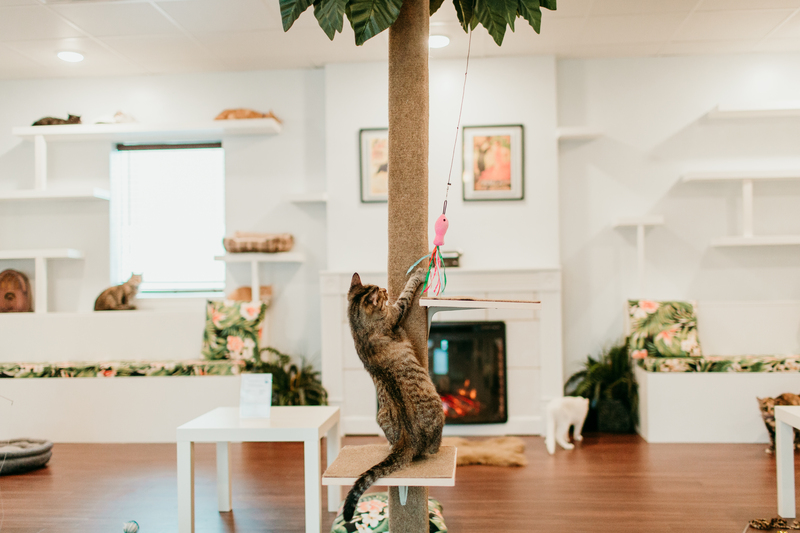 We are partnered with Boone County Animal Care to fill our cat playroom with adorable adoptable cats in order to improve the lives of homeless cats in our community and the lives of people who need more cat time (which is all of us, right?). Papa's Cat Café is great place to gather with friends, family, colleagues, or a fun date night. We serve Columbia's locally roasted Fretboard coffee. And, we provide people a chance to interact with lovable cats -- whether you are interested in adopting a cat for yourself, or if you cannot own a cat and just want kitten cuddles. Visit the different tabs on our website to learn about reservations, parties, special events, our menu, FAQs, adoptions, and more. Keep up with promotions, events, and all the latest happenings at Papa's Cat Café by following Facebook, Twitter, Instagram, and Hulafrog. An incredible show of support helped to raise over $15,000 in January 2018 that will be put towards bringing Columbia its first cat café! Thank you to everyone who pledged and spread the word about our campaign! You can still follow our story on our Kickstarter!